The right to dissent has been purposefully included in the American Constitution. It's interesting that while we are obsessed with stories of dissidents in other countries, most recently a blind activist in China, we are dismissive of dissidents here at home, no matter how important their message is. 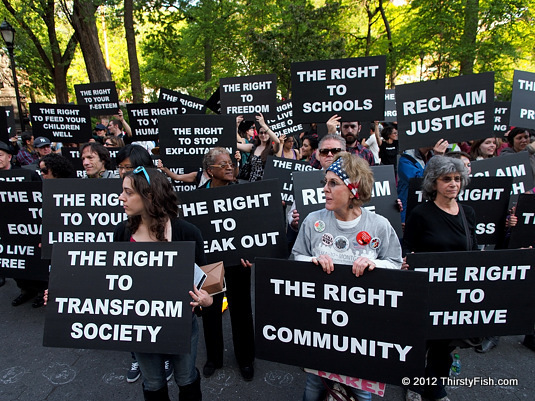 Before I left to take a few photographs of Occupy May Day, various news outlets were reporting that a few hundred people were gathered in certain locations throughout New York City. When I arrived at Union Square in the late afternoon, I was surprised to see an estimated crowd of 15,000 demonstrators at the park. 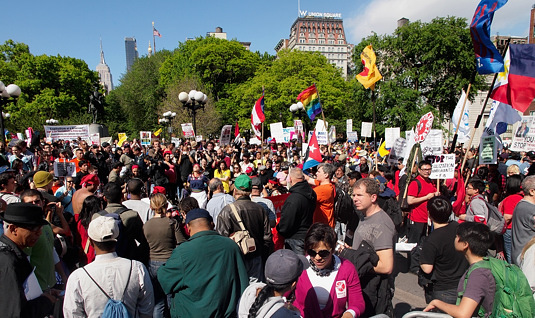 Was Occupy May Day a success? Despite police tactics like letting a limited number of people out of the park at a time, up to 25,000 protestors marched to Battery Park and Liberty Square. Media coverage of the event was very limited - I guess 15,000 to 25,000 people marching down Manhattan Streets is not that newsworthy for the mainstream media, whereas, a dozen Secret Service agents allegedly involved in a prostitution scandal has been newsworthy for weeks now. It is difficult to put a measure of success to the Occupy May Day event. I found the very diverse crowd of protestors to be as enthusiastic and energetic as ever. I will be watching the Occupy Movement's next few actions, as will the world, to see if Occupy 2.0 actually emerges. The message of the movement is what empowers it, and even if it does not yet offer concrete solutions, it has defined the problem accurately - more so than any other previous movement. Quoting Caine from Kung-Fu: "I seek not to know the answers, but to understand the questions". But once the question is accurately understood, what is the next step?